Total length: 31.5 cm, blade length: 20 cm - item number: 1896719992 - Other knife types and set combinations are available for this knife collection. 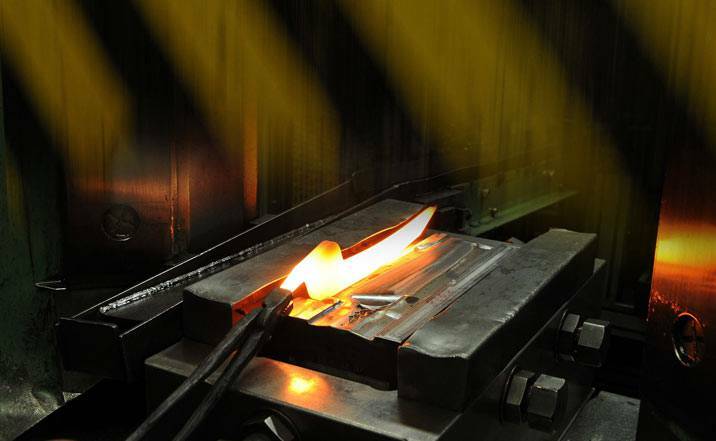 Material: Forged blade made of rust-free and acid resistant speciality blade steel. Long lasting sharpness thanks to the hardened blade. 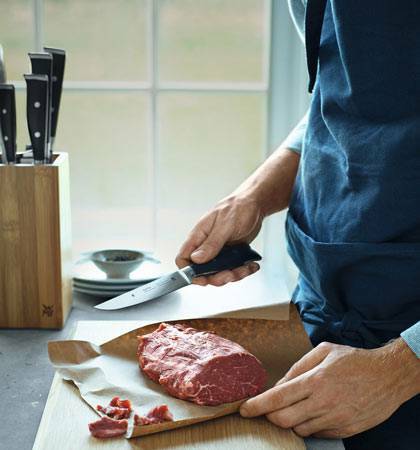 Riveted handle without grooves made of high-quality olive wood. Bread knife with double-serrated blade: Cuts completely straight without sliding of the blade in a slant. There’s nothing quite like gliding the blade of a bread knife through a loaf of fresh bread, breaking through the crust then cutting the crumb slice by slice – not to mention the anticipation of actually eating it. 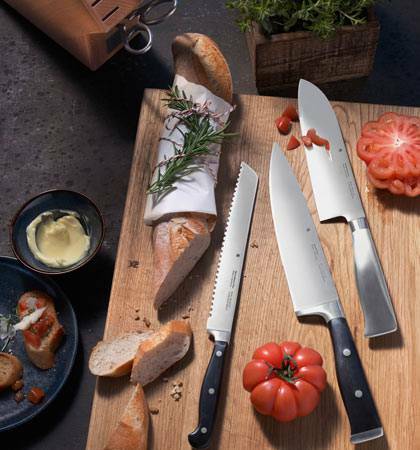 The long, sharp serrated blades of the WMF bread knives cut through all types of bread – including soft pastries such as croissants – with ease and are also ideal for cutting soft fruit. 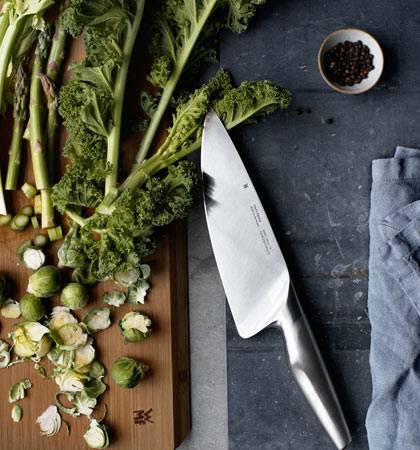 A good bread knife is a basic essential in every kitchen. The WMF models vary in appearance and size according to collection. Bread knives finished using Performance Cut technology are highly recommended. Thanks to their extreme, long-lasting sharpness, they cut through even the crustiest of loaves reliably. 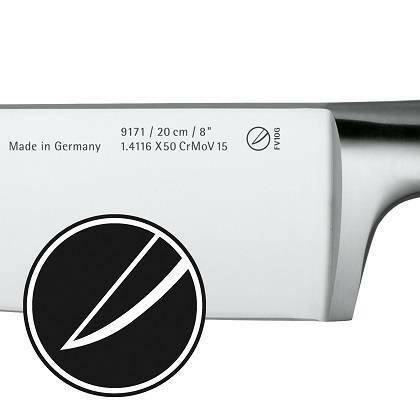 Incidentally, only bread knives from WMF have the patented double-serrated edge. 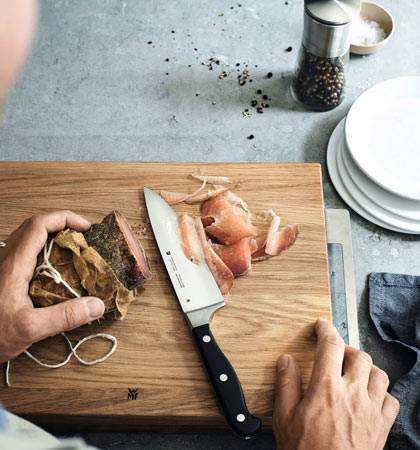 Blades with a double-serrated edge are serrated on both sides and cut straight down rather than at an angle, leaving you with perfectly even slices.